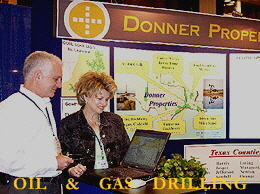 Donner supports companies interested in getting wells drilled, exploring for new fields and developing infield projects. In order to encourage the continued development of the almost 500,000 acres of minerals, Donner has adopted an “industry-partnership” attitude with oil and gas companies. Donner works directly with exploration companies by providing available, non-confidential data, seismic, title information and assistance with governmental agencies in order to expedite the exploration process. Donner has, on occasion, provided the “missing link” to a prospect, title information that saved thousands of dollars in legal fees, and information with contacts to expedite the necessary governmental process. Operators recognize Donner’s desire to work with prudent companies who respect the appropriate regulatory and environmental laws, as well as, properly maintaining their leases. The landowner-operator relationship is special. By exploring and developing new oil and gas reserves, Donner and the industry benefit as well as contribute products that enhance every citizens life and support our national security. For more information about our available oil and gas leasing opportunities or to schedule a meeting, please contact us via e-mail. You may also call us at 318-227-2131 from Monday thru Friday 8:30 to 5:30 CST. We look forward to doing business with you!